We provide new designing notching tooling to perform Pipe notching at ONE action, do NOT need notching side by side. 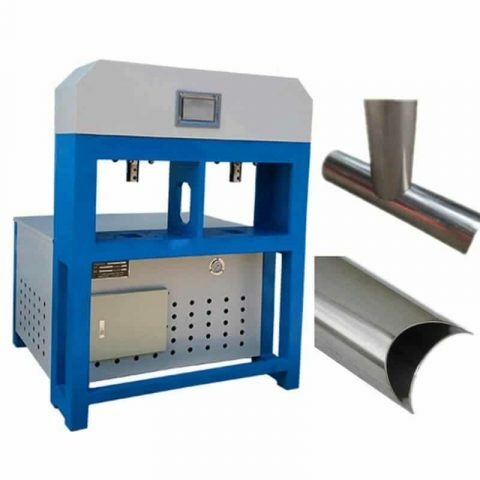 This model of tube notcher equipment is available for different material including iron pipe, alloy tube, plastic tube, aluminum pipe, copper tube, etc. And also, available for different shapes of profiles including round tube, square tube, oval tube, angle bar, metal sheet, etc. Hydraulic Pipe End Notching Machine Tube Notcher is widely used for punching holes for aluminum ladders profiles, steel guardrail, zinc steel fence, iron guard fence, aluminum alloy shelf bracket, handrail, balustrade, railing, banisters. Iron guard fence, aluminum alloy shelf bracket, handrail, balustrade, railing, banisters, etc. It will amount customize multi-heads of notching and punching molds integrated on one. Reasonable design notching and punching set, to ensure smooth pipe processing. The whole machine must be processed by gantry milling to ensure high precision performance. Punching power is driven by the hydraulic unit with auto-cooling system. Hydraulic driven to save more energy than power press. Notching pipe both sides at ONE action, No need pipe notching from side to side. To increase much production and save labor cost. Can be designed as a single head, 2 heads, 4 heads, and 6 heads, 8 heads as per requirement. 24 months warranty for punching machine, 12 months for notching and punching die set.